Many people tend to overestimate or underestimate exactly how much carpet they need; because carpet is usually priced per m2, doing this can prove costly. Making sure that you get the right amount of carpet for your room sizes could save you a lot of money and reduce wastage too. When it comes to measuring areas for carpet, issues can sometimes arise where a room has an alcove or recess; as these areas are easy to forget about and miss when calculating the amount of carpet needed. 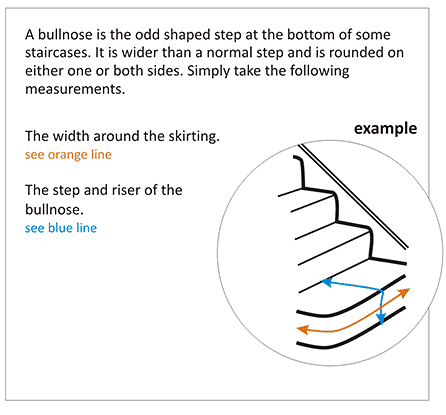 Stairs can often seem a little difficult to measure just because of the shape of them. Different carpets are available in different widths and the aim should always be to minimise the number of joins needed. So it’s well worth making sure you have your measurements to hand; before deciding on the style and design of carpet you’d like. In this guide, we’ll explain how to measure carpet for different floor areas, starting with a standard room. 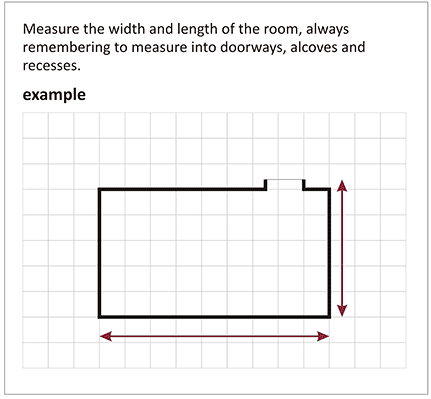 If your room is rectangular or square, this is straightforward; simply measure the length and width of the room at the widest point (including going into doorway areas) and multiply the measurements to calculate the size of the floor surface. Always add 10 centimetres to your total length and width measurements. This will allow for any deviations in the wall & the cutting of the carpet / vinyl when it is fitted and ensures a good finish. Be careful as many rooms are not square and even allowing 10cm will not always be enough. A good way to make sure you don’t miss any wall areas is to sketch out a plan of your room. Include any doors, windows and recesses. Then take into account all these areas when measuring. To be on the safe side, you could measure every wall in the room; including the depth of any alcoves which will come in handy if you need to join two or more carpet pieces together. 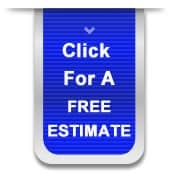 By measuring every wall, you will have all the measurements you need. Always add 10 centimeters to your total length and width measurements. This will allow for any deviations in the wall & the cutting of the carpet / vinyl; when it is fitted and ensures a good finish. Be careful as many rooms are not square and even allowing 10cm will not always be enough. Always add 10 centimeters to your total length and width measurements. This will allow for any deviations in the wall & the cutting of the carpet / vinyl when it is fitted and ensures a good finish. Be careful as many rooms are not square and even allowing 10cm will not always be enough. 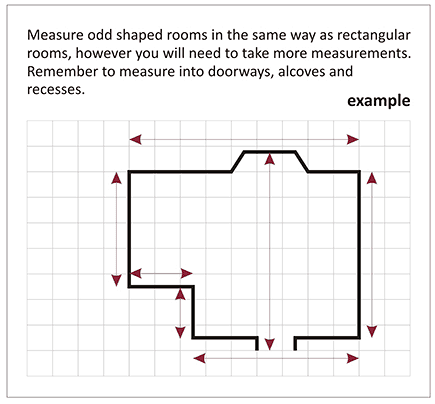 As with measuring a standard room, you could sketch out a plan of the landing area to make sure you include all areas including recesses and doorways. 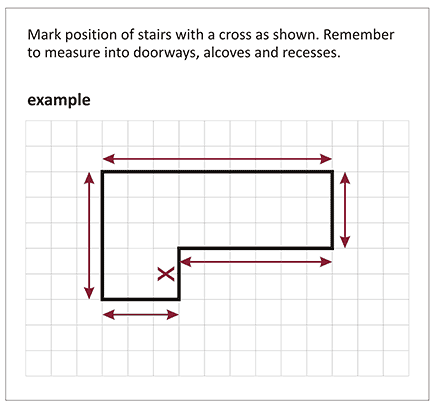 Stand on the top step to do this and mark on your plan where the landing meets the stairs. Measure the width and the length of this area; (including the height and width of the top step) and multiply measurements to calculate how much carpet you’ll need. If you have a mid-landing, measure this as you would for a normal landing area. 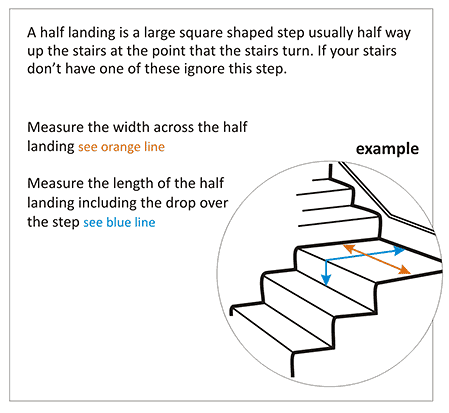 It must fit over the top step in one piece; so you’ll need to measure the mid-landing width and length as well as the height and width of the top step. Always add 10 centimeters to your total length and width measurements. This will allow for any deviations in the wall & the cutting of the carpet / vinyl; for when it is fitted and ensures a good finish. Be careful as many rooms are not square and even allowing 10cm will not always be enough. 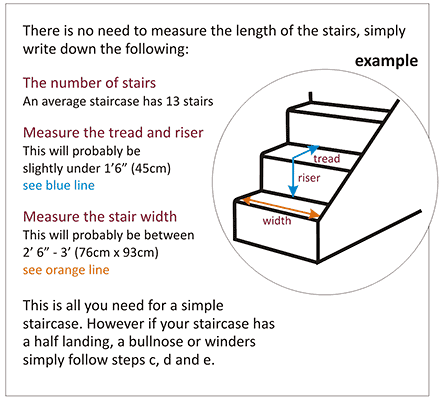 To measure stairs, first of all double check a few of the stairs to make sure they are the same width and then measure the riser (height) and tread (depth) of one step. – This is the length vertically up and over the step. 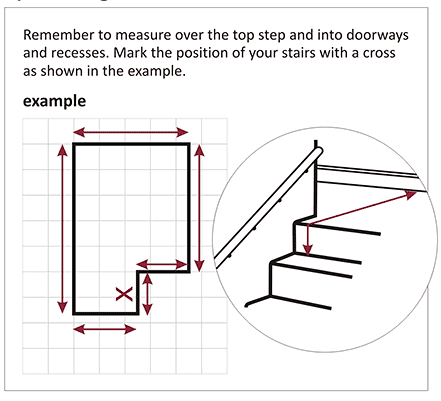 Multiply that measurement by the number of stairs that you have. 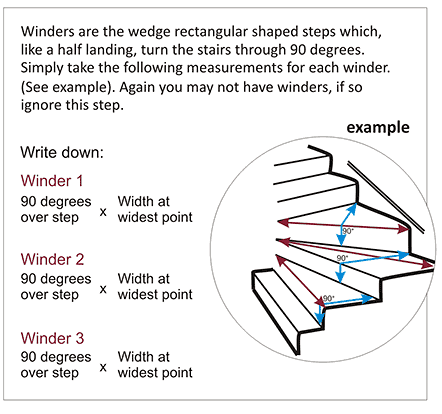 If you have a winding or corner staircase; you will need to make a note of a few different measurements for the winder section. There are usually three winder steps to consider. For each one, measure the length (the rise and tread) of the step as well as the width of the winder step at the widest part. – This could be the edge of the step, the middle or the back depending on how the stairs are fitted.